On a recent Friday afternoon in Princeton, I ran into a young man working to recruit high schoolers to Princeton Football. Brad Baker is the Assistant Director of Football Operations for the Tigers. After talking for a while, it was easy to see the connections between football and entrepreneurship. Every athlete knows that success in the sport is based on hard work, team effort, and execution. The people behind great teams also know the value in finding and keeping talent, detailed planning, as well as the ability to adapt quickly. But these are also the qualities of a successful entrepreneur. Just look at Roger Staubach who used the same skills and determination that helped the Cowboys win the Super Bowl five times, into a successful real estate business. Brad used an entrepreneurial mindset and a strong work ethic to break into the business, and this mindset is helping him to navigate the ups and downs of sports management as well. He has spent recent years working behind some big names as well as World Champions--from the Chicago Bears, to the San Francisco 49ers and now Princeton Football. Brad with ESPN's Sam Ponder and colleague Cole Schlitzer during his time with Iowa State Football. I asked him to share some insights on what it is like working in off the field and behind the scenes of one of America's biggest industries. Steve Mariotti: You've spent the last four years working in Sports Operations at five famous organizations; tell us about it. Brad Baker: It has been remarkable and a great journey so far. I have gotten to meet a bunch of great people and make memories ranging from carrying around the NBA Championship Trophy to walking alongside some of the smartest people in the world here at Princeton. 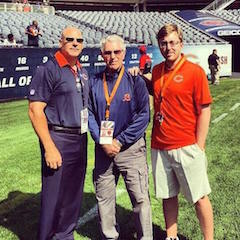 I have also been lucky enough to work for the Chicago Bears--my family's favorite team for eight decades! The Training Camp Ops staff in Chicago showed me what a work family truly looks like and how important that is. SM: Many sports enthusiasts would die for those experiences, tell us what you've learned. BB: The Texas Legends taught me to always be open and able to wear different hats while Iowa State Football taught me to grab everything I could. Chicago Bears showed me the importance of being an efficient worker instead of just being a hard worker. Beyond that, at San Francisco I learned time management and now Princeton Football is teaching me all about tradition. My career path has taught me to think outside of the box and on my feet. Whether it is a coach coming up to you minutes before a practice, game or a road trip with changes, or a vendor being late with a team meal, you have to have multiple backup plans at the ready. You can only plan so much in life and then at some point you just have to go with it and find solutions on the run. I was always detail-oriented growing up but I never realized how important it was until I got to run the behind-the-scenes logistics for these organizations. 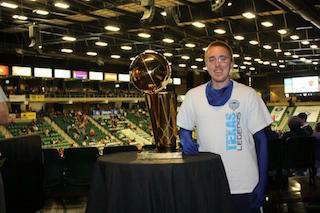 Brad with the 2011 Dallas Mavericks NBA Title trophy; The Dallas Mavericks own the Texas Legends who Brad first started his career with. SM: What inspired you to pursue a career in sports? BB: I grew up in a corporate family where business and entrepreneurship was drilled into me. My Mom and Dad both have very successful stories in their respective industries through hard work and dedication with an entrepreneur mindset. Growing up in Texas around high-quality sports 24/7/365 was beneficial too. SM: What is on the horizon for you? BB: The dream is to be a Pro Sports Team President with a chance at owning my own team at some point, whether that is part of an ownership group or just outright. Continuing to work in sports is a dream come true. Plus, I get to call a stadium my office. That is cool. SM: Advice to people trying to get in the industry? Expect to hear "No" a lot but do not let that knock you off the path. Work harder than everyone else around you while grabbing everything you can. Do not let the big names around you affect your mindset, they are people too. Be relentless, caring and humble.